Mother to Clearway, Wodka (Lord), is a guarantee for excellent performance horses. She has proven that with the stallions Conway I and II, Clearway, Arturo and the sporthorses Chika’s Way and Carassina who are competing at the highest levels. Mother to Cayado, the mare Irrada, has the Cor de la Bryere son Calando I as father. 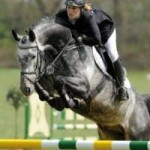 This stallion has shown both scope and tremendous willingness to perform in international show jumping. The mare Errada, is full sister to Corrado I and II. As is her full sister Fayence, who produced the Contender son Chellano Z.